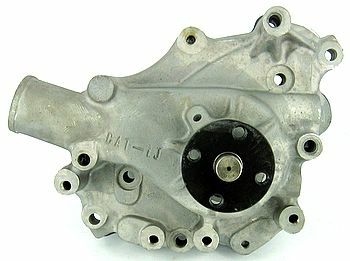 These water pumps are manufactured from aluminum alloy for extra strength and longevity. CAT Power Water Pumps have a large 3/4" integral ball bearing and high strength roller bearing to with stand higher torsion loads at high RPMs. Each pump is put under an endurance test in-shop for hours to ensure the best quality. APPLICATIONS: # SB Ford # 302 from 1970-1978 # 351W from 1970-1987 # Measures 5 7/10" from block to hub.